This may be the first year I have ever kept a New Year's resolution. Although, since I rarely even make one, I can't say that there has been much competition. Regardless of years past, I'm really glad I kept this one. I had resolved to work on this blog more: at least one post per calendar week. While I was hoping to get a few more in, I'm still rather satisfied with 59 posts. There have been weeks where I easily threw up two posts without even flinching. And there have been weeks where even doing one post felt like a chore. But I'm okay with that. This year saw a fair amount of change at 6CD. Between moving and adjusting to a new kitchen, a lengthy jury duty stay, the loss of my grandparents, and helping to start and run a DIY dining space, I am definitely in a different space than I was this time last year. But I am ready for more and eager to see what 2010 will provide! I'd also like to take this space to briefly thank the people who voted for me for a Homie Cooking Award (sponsored by The Kitchn)! I'd tell you all to go and vote for me, but even I realized this too late. The first round of voting is in and I didn't make the final cut, but it was just really nice to see that people (even though they were only two people) gave me a vote. So thanks again! It means a TON to know I'm not just talking to myself out here. Trust me. Anyway, I'm just relaxing here; prepping some food for a potluck New Years party this evening. (I'm making a Kale and Gorgonzola Gratin with a Panko crust.) So, as I sign off for the last time this year, I wish you all a happy and healthy New Year! Happy New Year, everyone! As much fun as they are to make, I still prefer making them only once a year. It just makes things more special. so, how about you? 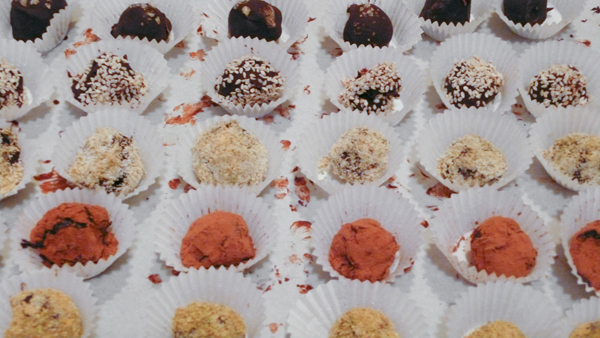 Any special holiday gifts being made in your kitchen this year? I want to hear about 'em! So far we have somewhere between 4 and 8 inches of snow here in Baltimore, depending on where you measure. But I'm all for snow. The city looks so much better and peaceful under a thick coat of the fluffy stuff. And when things get nice and quiet (Baltimore pretty much shuts down in the snow), there is not a whole lot to do except make some food. So I decided to make a simple soup featuring some green beans that were sort of on their last legs. This is actually a pretty quick soup to make, depending on whether or not you have some vegetable stock on hand (like i had). In a large pot, heat vegetable stock to a slow simmer. In a large skillet, heat butter and gently saute the green beans with the lemon juice and herbs de provence. When just tender, remove the beans from the heat. Place green beans in a blender and blend until smooth. 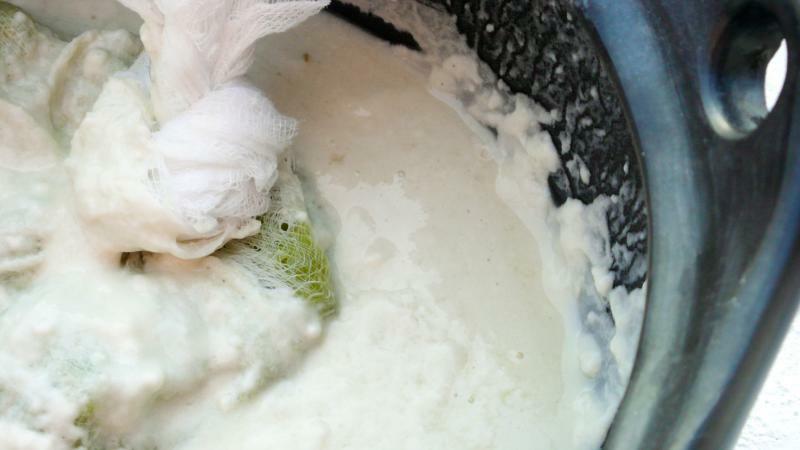 Add the mixture to the stock, along with the cream, and stir to combine. Season with salt and white pepper to taste. When done, get outside and shovel! Aioli is not quite the same as mayonnaise, but still very similar. It is also one of those things that people would usually shy away from making at home. Making it is dead easy and will make your forearms look just like Popeye. Here, we've added horseradish instead of the traditional garlic. The amount of searing heat in horseradish can differ from one horseradish root to another, so add as much as you can stand! 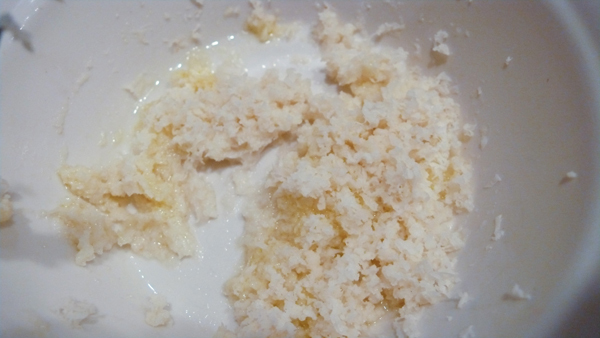 Grate as much horseradish as desired and combine with 1/2 the lemon juice. 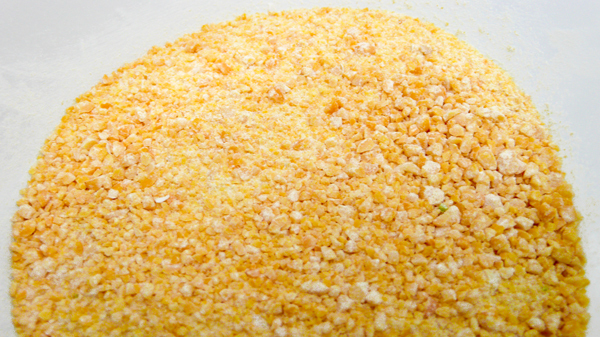 In a large bowl, mix egg yolks, 1/4 the lemon juice, mustard, and a little salt. Whisk thoroughly to combine. From a squeeze bottle, gently pour in a drop or two of the neutral oil. Whisk this into the yolk mixture, only adding a few more drops when the oil has been fully incorporated (and NOT before!). After 1/3 of the neutral oil has been incorporated, you can add a little more oil at a time, but never stop whisking. When the neutral oil is all incorporated, add the remaining lemon juice and the horseradish. Whisk well to combine, and start the process again with the olive oil. Taste for salt, pepper, and horseradish and adjust properly. 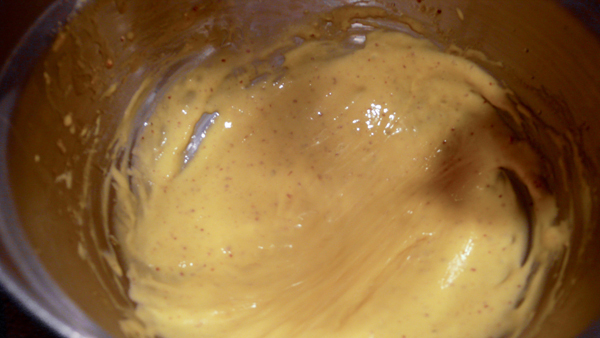 Letting the aioli sit covered and overnight in the fridge will intensify the horseradish flavor a little bit. Consider making this the day before you need it to allow time to either add more horseradish, or another egg yolk and some oil to tame the heat if it is too powerful. One of the benefits of working in a woodshop is having unbridled access to hardwood sawdust. And if you read the last two words of that sentence and instantly knew where I was going with this: give your self a firm pat on the back. That's right: smoking. Hardwood sawdust is ideal for smoking as it requires no pre-soaking. Check out Alton Brown's do-it-yourself smoker for more info. This is just a quick smoke. One change of sawdust should do it. But, I guess you could cheat and just use liquid smoke if the weather isn't cooperating (say maybe some sort of wintry mix, perhaps?). Set up you smoker with hardwood sawdust (maple in my case). Smoke the cocoa nibs in a cheesecloth pouch for one change of sawdust. This should take about an hour or so. Mix with crème anglaise and bourbon and place in the freezer. Stir every one in a while and refreeze until desired consistency is reached. So here's a new thing for Six Course Dinner. For the first time (but not the last?) 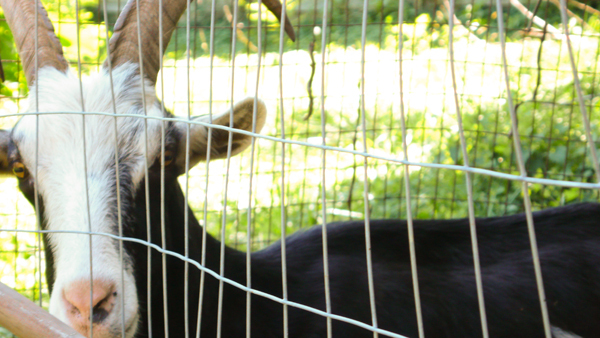 , we have a guest post. This comes from Ashley North Compton of The Wanderous. You have been reading The Wanderous, haven't you? Six Course Dinner was lucky enough to be apart of The Wanderous a few times over the summer, and now it is time to repay the favor. So here is Ashley's take on some perfect autumn snacking foods, as well as a few gorgeous photos and the sassiest writing to ever grace 6CD. Without further ado....Ashley? If you are ready? Oh fall, you're back and I am happy for your abundant return. I think, if nothing else, fall is a celebration of variety. Lots of tonal, saturated colors abound. Many different textures and tastes are available naturally. Bitter and savory mix with natural-sweet [think root vegetables] + spicy. Said spice[s] compliment the crunchiest of apples and the succulent-est (uh...) of squash. I could go on; I will spare you. 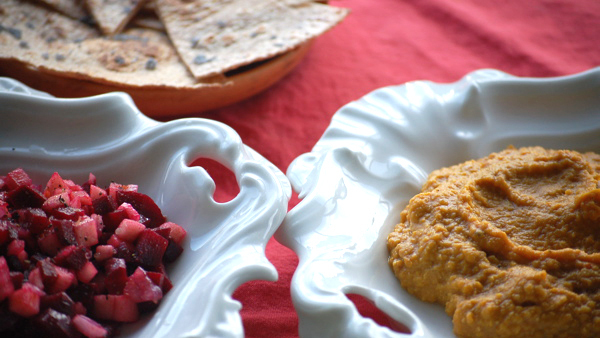 In no particular order- beet apple salsa + curry-pumpkin hummus. Served in tandem to kick the autumnal color-qualities up a notch with an edible dipping mechanism[s] of ones' choosing. Tending towards temperature contrasts, I made homemade [read: slightly crunchy but mostly warm] spelt tortilla chips topped with black sea salt. Natural charcoal on the salt is detoxifying- and also, contrast is pretty. Truly- this duo, separate or together, would be good on many-an item...from a grilled veggie to a rice cracker to within a wrap or atop salad. Dips are sort of awesome that way- they keep for a while and are endlessly malleable to form, or supplement, other dishes at a later date. [makes about 2 c; double/triple to your hearts content]. Peel and steam the beets. 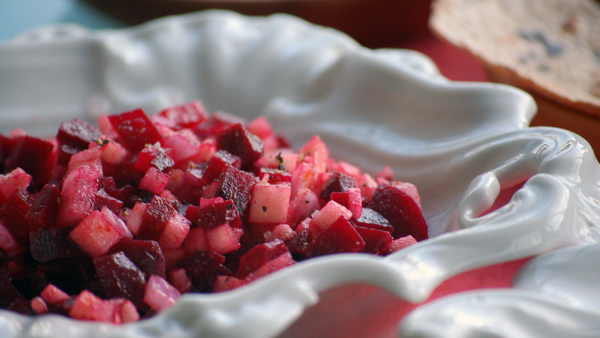 Beets are lovely roasted- but steaming keeps a bit more of the crunch. Next, dice the apple, onion and said (now cooled) beets. Mince the garlic and add, then the cayennes after de-ribbing and de-seeding them [unless you are a badass]. Combine with all other ingredients. Combine all in a food processor. Add more olive oil if need-be. 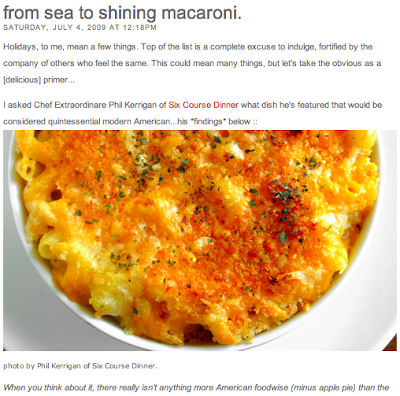 Either recipe is easily doctored and is notably subjective. Consistencies and 'hotness' can be altered to one's liking. The only requirement is both, respectively, must be placed in pretty little bowls. Not too shabby, I would say. Thanks, Ashley! Job well done! All of those words and photos are property of Ashley North Compton, so show 'm some respect, eh? 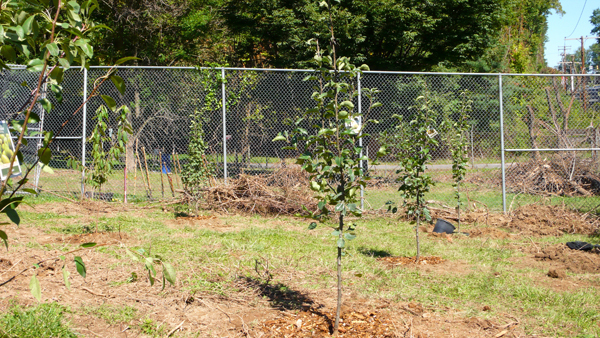 .............................................................................................See this asian pear tree? It has just found a new home right in that spot. I know because I put it there. I dug the hole to the correct depth. 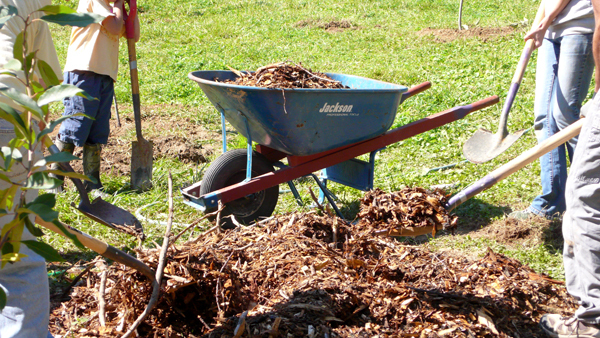 I cleared out all of the old and gnarly roots that were there from some long gone tree or vine. I made sure the tree was level. I checked to see that the bud union faced north. I filled in the hole with rich soil. I built a berm around the tree. 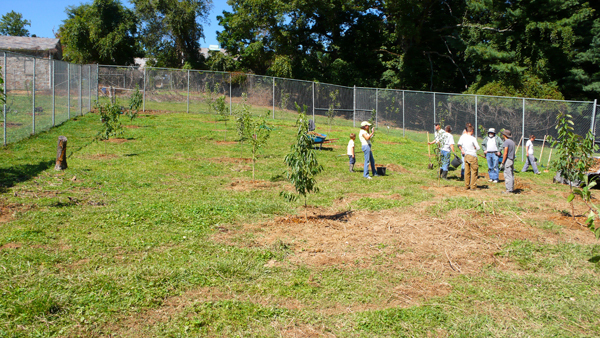 This tree is now apart of the latest addition to Great Kids Farm, a farm owned by Baltimore City Public Schools that helps teach students about the sources of healthy foods as well as supplying the school system with nutritious foods instead of frozen/canned/processed foods. 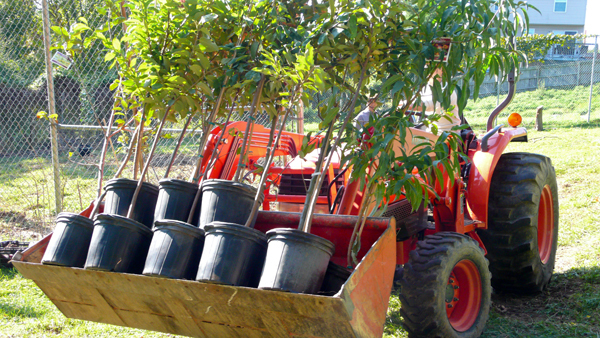 About 25 or so volunteers spent a few hours at this gem of a farm to help plant a 'mini orchard' of apples, plums, persimmons, peaches, and even asian pears. 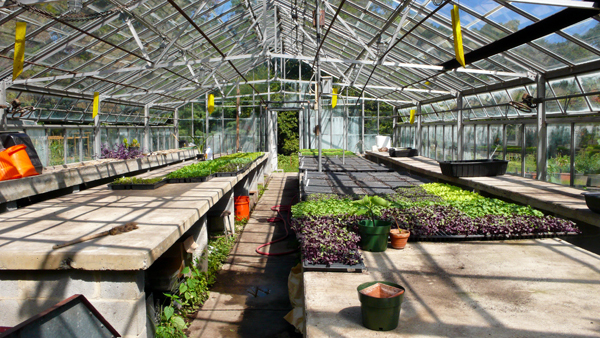 The hope is that students will come and learn more about where their food comes from as well as directly take part in growing the very food that will end up on their cafeteria tray. It is an amazing thing being done by Baltimore City Public Schools, and more directly, Tony Geraci, the man who started it all (and recent winner of Baltimore City Paper's "Best Public Servant" award). I heard Mr. Geraci talk a few weeks ago about the program and I am very glad to be able to help out. "Ancho Chile Sourdough Brownie Waffles" or "Using Your Sourdough Starter"
You have been using your sourdough starter, right? Good. Because I'm getting pretty excited by mine. Latest creation, the extremely elusive ancho chile brownie waffle. 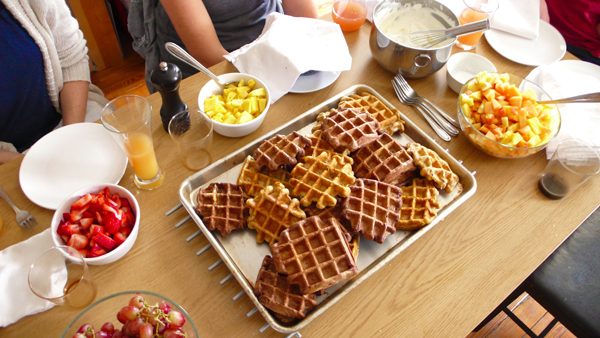 A breakfast years in the making, these waffles can definitely be filed under "fuel in the tank". 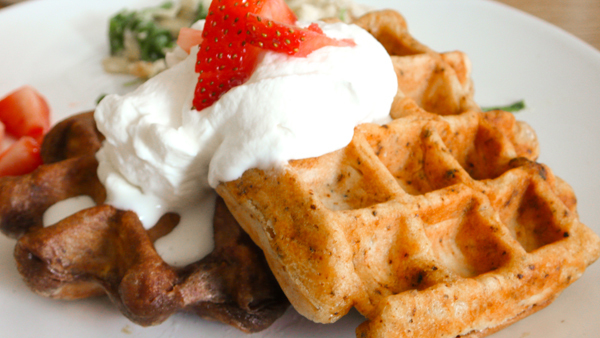 I'm not going to post the waffle recipe here, as it is directly evolved from the King Arthur Flour recipe. Simply make a double batch, adding some cocoa powder and 72% chocolate to one batch and three ground up ancho chiles to the other. Top with some strawberries and some freshly whipped whipped cream and serve alongside a few incredible people. I know that I have recently done a post featuring salmon. I'll admit it, salmon is probably my favorite fish. I could go on and on about how much I could eat it at any meal of the day, but that is time better spent cooking rather than preaching. So, here is a simple and delicious accompaniment to a nice fillet of salmon. In a pan over medium heat, add butter and cook until melted. Add finely chopped shallot and cook until starting to become translucent. Before the shallots have begun to brown, add blueberries, stirring in to coat with butter in the pan. As the blueberries begin to cook, they will start to soften. When they do, gently crush then with the back of a spoon. When the pan is full of a wonderfully purple paste, stir in mustard. Cook down for one minute to remove excess moisture. 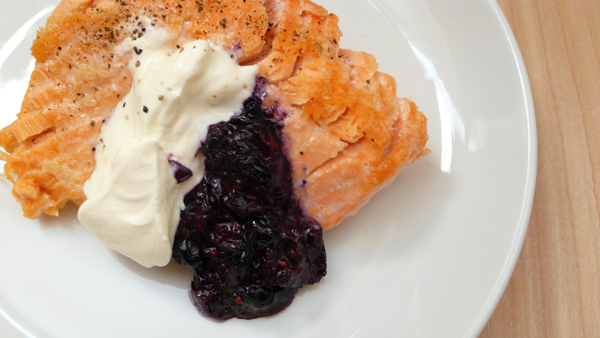 Season with salt and pepper and serve with salmon and a nice dollop of fresh sour cream. This quickly assembled union of soba noodles and summer squash is one of those meals that is ready even before you've set the table. The whole dish can be prepared before the water has even come to a boil. Having only four main ingredients to gather up doesn't hurt either! 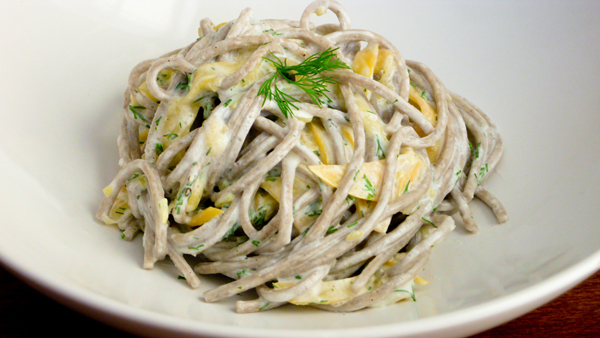 It's a simple summer noodle dish of cool soba noodles and summer squash lightly coated with some fresh dill infused crème fraîche. The only thing left to do is lightly season with salt and pepper and you are all set. My personal best "fridge-to-table" time" is 7 minutes. Think you can beat that? In a large saucepan, bring 3 qts. of water to a boil over high heat. Meanwhile, finely slice the summer squash with a chef's knife, or on a mandoline, and place in a large heatproof bowl. Place the bowl in the sink. When the water is boiling, add the soba noodles and cook for 4-5 minutes, or until tender. Place a colander over the bowl containing the squash. Pour noodles and boiling water into the colander, so the bowl collects all of the hot liquid. (This boiling water will briefly blanch the thinly sliced squash.) Separate the colander from the bowl and move the bowl to the counter. Rinse noodles under cold water until they are nice and cool, about 1 minute. Place the colander back into the sink and poor the squash over the noodles. Gently rinse again to cool the squash down. 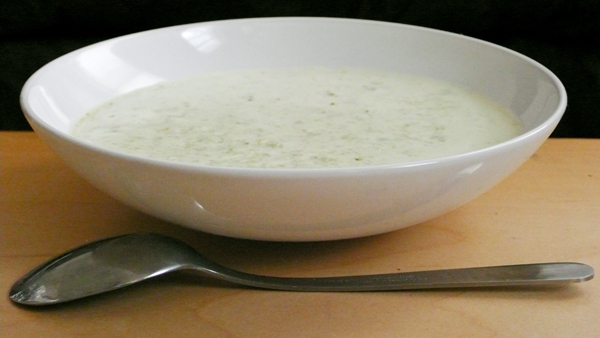 Move both ingredients to a bowl and fold in the dill and crème fraîche (you can substitute sour cream in a pinch). Season with salt and pepper to taste. (Maybe add a little crushed red pepper, if you like....) Serves two. In addition to death and taxes, I'd like to add unbearable summer heat to the list of guaranteed certainties. I made it through June and July remarkably well, but August? That's a different beast altogether. Hot and sticky are two things I don't like to be (as well as rude and homicidal while we're at it), but I can take solace in two other 'sure things': that fall is on the horizon, and that our blasted sun I've been silently cursing is largely responsible for a plethora of great summer vegetables. And for that, I am grateful. This is the time of the year when I rarely fire up the stove so I like to take advantage of really good ingredients and try not to mess with them too much. For example, only two of the ingredients in this dish ever come in contact with heat, and when they do it is not for very long. 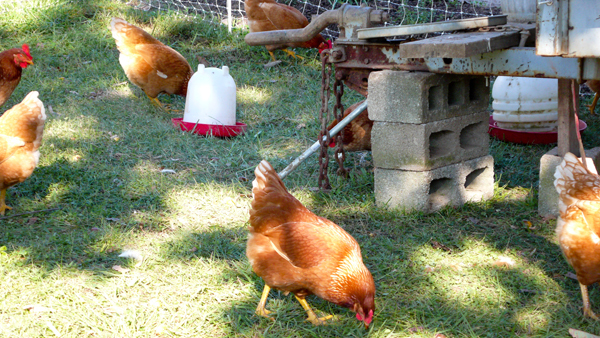 In fact, most of this dish can be prepared between runs through the sprinkler. Which would be a good thing if only I had a sprinkler to run through. Oh, well. 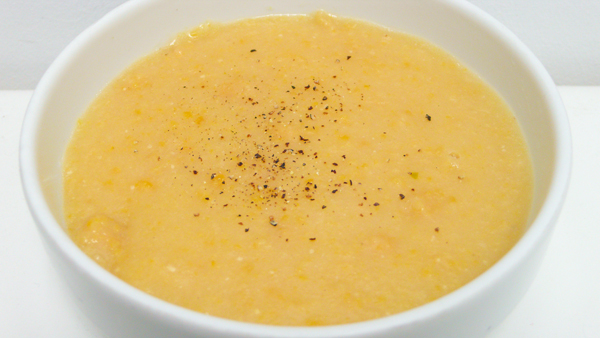 In a blender or food processor, blend sweet corn into a smooth puree. Move to a small saucepan and gently cook over low heat, adding the white wine. Feel free to add some cilantro stalks at this point as they have great flavor and are easy to remove before plating. Let this gently cook for about five minutes and then remove form heat. Season with salt and pepper. With a mandoline (or some good knife skills) slice green beans lengthwise into four or five slices each. Chop in half when done and reserve. Slice a little red onion this way as well. Have your cilantro cleaned and finely chopped and with grapefruit sectioned and free of any pith. In a saute pan, heat olive oil over medium heat. Prepare salmon by running the back of your knife blade against the skin. Go with the direction of the scales with firm pressure to try to press out as much moisture as possible. This well help to develop crisp skin. Lightly season with salt and pepper. Sear salmon skin side down until nice and crisp. This should not take long. When skin is a healthy golden brown, gently flip the fish over to cook the flesh. Reduce heat and cook until the salmon is cooked medium to medium rare. (Time will depend on thickness of the fish.) remove from heat when done. To assemble, ladle sweet corn/white wine broth into a wide and shallow bowl. 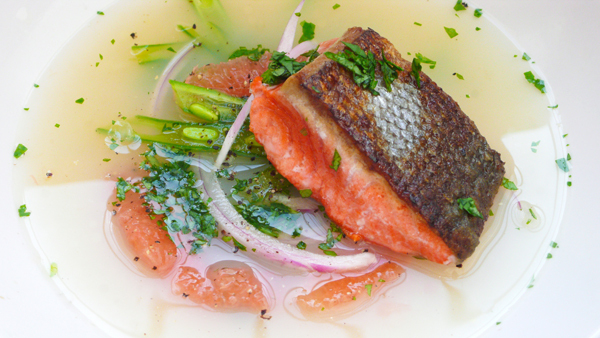 Top with green beans, grapefruit, red onion, cilantro, and finally the salmon. Sprinkle with a little extra salt and pepper and serve. Makes two servings. The above photo contains three things that alone are not that spectacular, but when they get together: magic happens. Flour. Water. Grapes. Done. Thats all. Well, plus a little time. 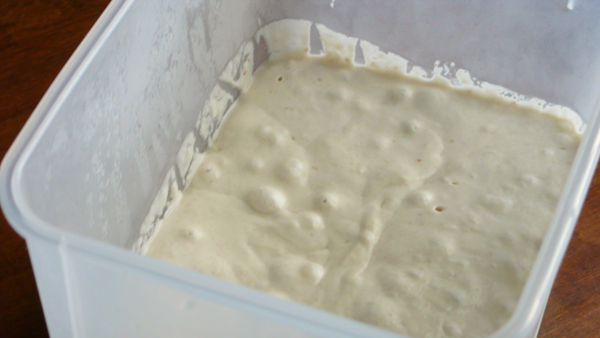 Behold: my first sourdough starter. In a large clean bowl, mix flour and water (measured by weight). Crush grapes and wrap in cheesecloth. Reserve any grape juice and add to mixture. Add packet of grapes. Cover with a clean dish towel and store at 70-80F. After the mixture has started to ferment (anywhere from 1 to 5 days, remove grapes and add 1/2 cup of flour and 1/2 cup of water. 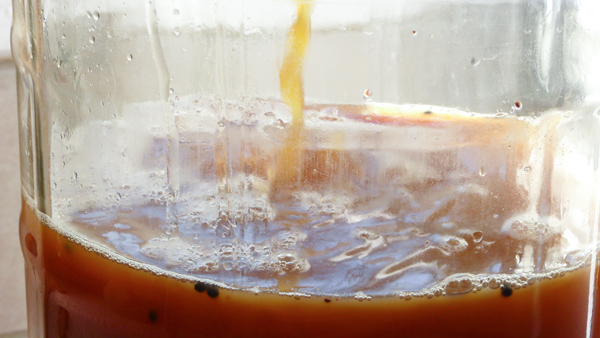 Do this once or twice a day for 3-4 days, then transfer to a clean container and refrigerate until ready to use. You will have to feed the starter periodically. So far, summer here has been rather bearable. It's been hot here and there, but overall I haven't been forced to sit in a certain chain bookstore for hours on end just to enjoy the air conditioning. I like when it is not too hot. Give me spring, fall, and winter any day of the week. I could easily skip the summer heat and be completely content. So, in the spirit of our relatively cool summer (only 80F today), I decided it was okay to fire up the oven: but only for a few minutes. In my mind, the oven is reserved for only cooler weather. So I decided to make something that easily could work in both warmer and cooler weather. 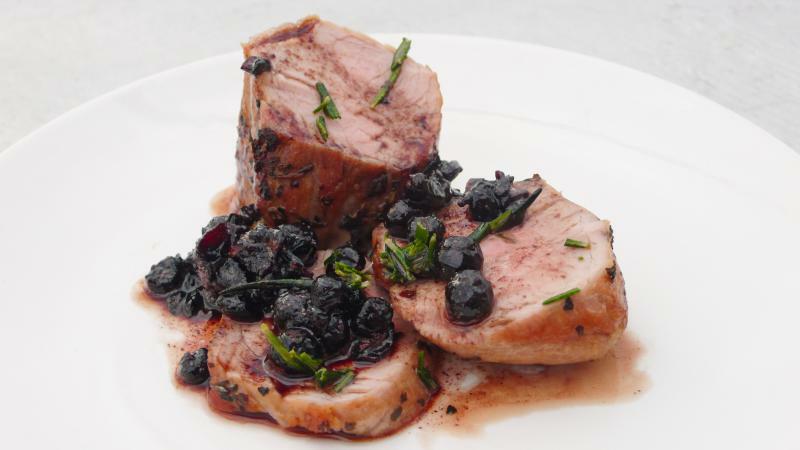 The use of blueberries gives the pork a nice and juicy partner and the rosemary adds a certain brightness. Summer food? Winter food? Who cares! Good food is for every season! Preheat oven to 425F. In a large (ovenproof) saute pan, heat olive oil over medium heat. Add 2 sprigs of rosemary and heat for one minute. Meanwhile, season pork with salt and pepper. After the oil has taken on the flavor of the rosemary, remove the sprigs and add the pork, browning on all sides. When well browned, move pan to the oven for 10-15 minutes (depending on circumference of the loin) and roast. Remove loin from the pan and let rest (under a loose piece of aluminum foil) for 5 minutes. Turn off the oven. In the same pan, add the chopped onion and gently cook until translucent. Add the blue berries and the remaining sprigs of rosemary. Add wine and reduce heat. Reduce wine until about 1/4 cup. Remove rosemary. Stir in the butter and let the sauce cool for a few minutes. Taste and salt and pepper appropriately. Slice the pork on the bias and dress with some blueberries and wine and a little chopped rosemary. 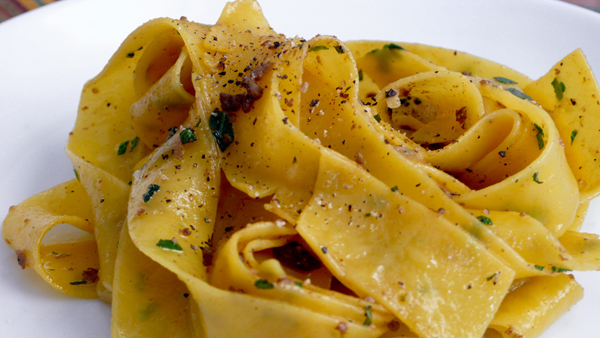 Call it pasta. Call it salad. Just don't call it pasta salad. Using a vegetable as a "noodle" is a great way to keep your kitchen cool in the summer. There is no heat applied and every ingredient can come straight from the fridge. All you need are a few good knife skills (and maybe a mandoline) to create very thin noodle-like strands from vegetables. My noodles ended up about a 1/16th of an inch thick: perfect for a noodle. Add a little bit of extra flavorings and you are ready for dinner. Take the zucchini and slice into very thin slices with a sharp chef's knife or on a mandoline. Stack the slices to recreate the original shape of the zucchini. With your knife, slice into 1/16th of an inch strips. 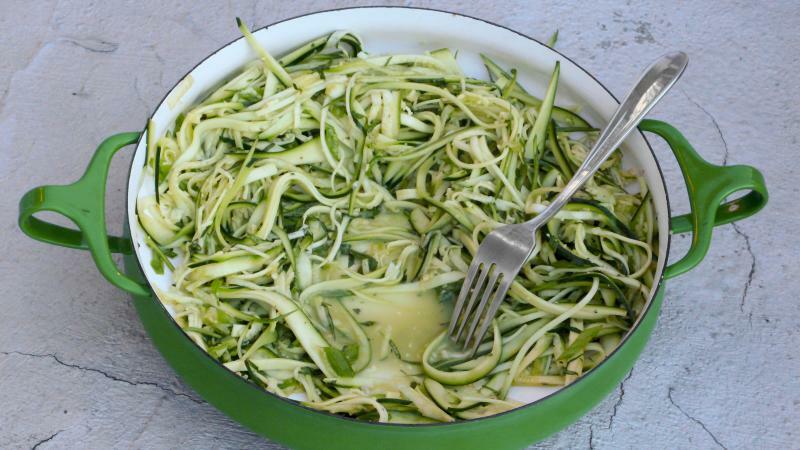 Place all zucchini noodles into a colander and lightly salt. Let sit for 30 minutes to pull excess moisture out of the vegetables. Move to a large bowl. Chop basil into very thin pieces, like a chiffonade. Add to zucchini. Slice the greens of the scallions and add to the noodles. Season with salt and pepper, and add olive oil and vinegar. Toss well to coat each noodle with the dressing. I don't really like to announce these things to large groups of people, but..no post this week. I'll be out of town attending the funeral of my grandfather. 95 years is a long time to live. We should all be so lucky. Summer is in full swing, which means one thing: tomatoes. Although tomatoes have been popping up at the local farmer's markets for weeks now, the really good ones are just starting to show up. This morning, one bunch of orange colored tomatoes caught my eye. Determined not to just eat them like an apple, I thought I would turn them into an even more refreshing treat: sorbet. I did not want to make it too sweet (which you could if you wanted), as the tomatoes already have a very distinct sweetness in their own right. Just a touch of added sweetness, and a healthy does of rosewater, and a few other ingredients and I was ready for the icebox. 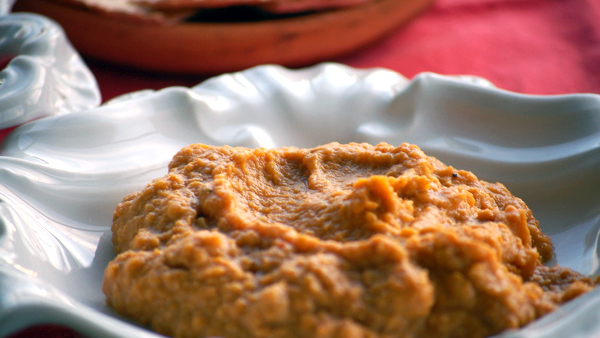 In a food processor or blender, puree tomatoes until smooth. Pour into a large, but shallow baking dish. Mix in rosewater, lime juice, vodka, and sugar until well combined. Sprinkle with a pinch of salt and place in the freezer for three hours. 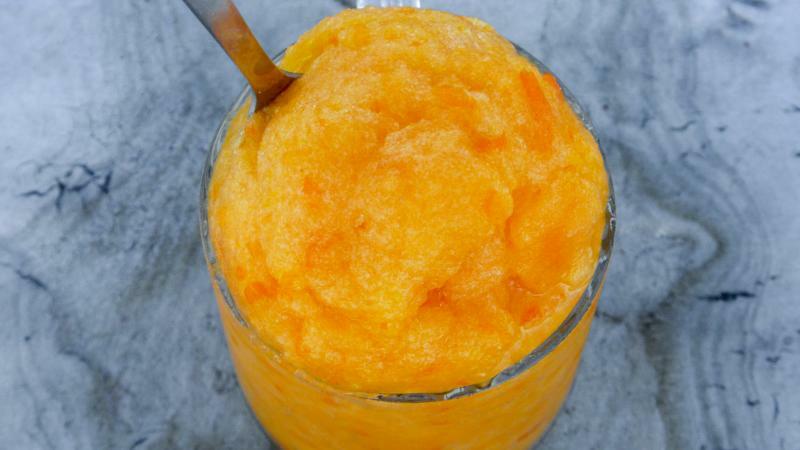 Every half hour, stir the mixture with a fork to break up large ice crystals. If stirred properly, the end result should be very smooth. Serve cold (and preferably outside). 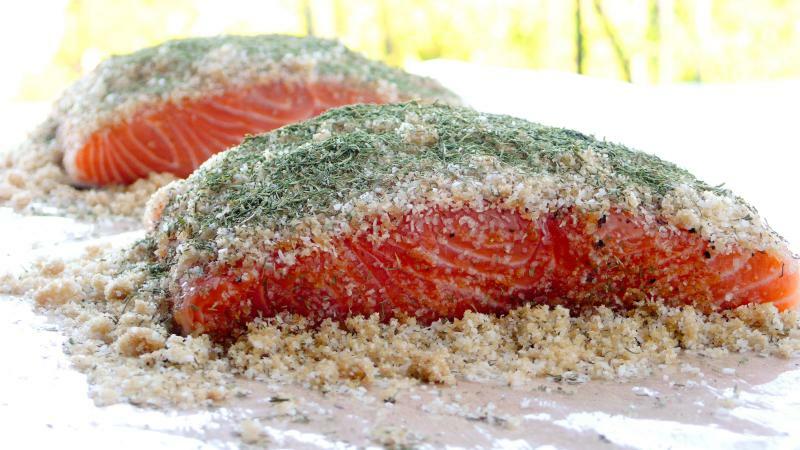 It is pretty much a simple equation: salt + sugar + salmon + time = heaven. How I love salmon. Such a delicious fish that's diversity continues to astound me. I love it pan seared. I love it grilled. I love it poached. I love it smoked. But the most simplest method I find is to salt cure the salmon. Salt curing involves no application of heat (which is great for the summertime), a handful of staple ingredients, and a small amount of refrigerator space. The only other ingredient is the most pesky one: time. 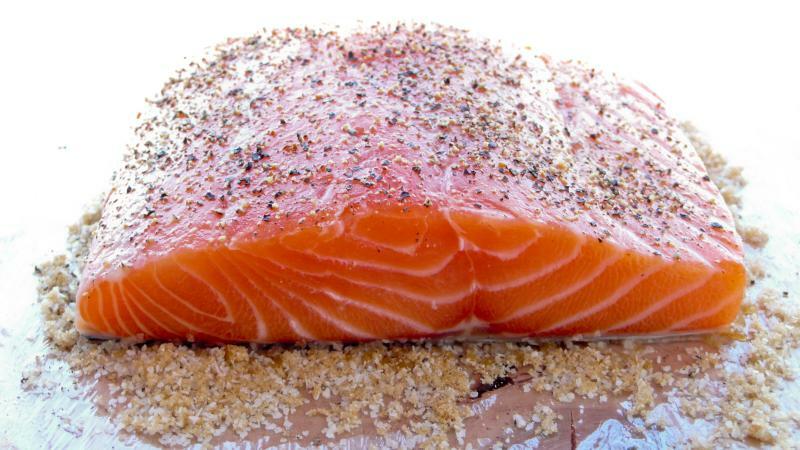 Unlike curing duck breast, making salt cured salmon, known as gravlax, takes only a day or two. Still, just knowing the silky texture that awaits you can make those 48 hours almost unbearable! 2 fillets of salmon, totaling 1 lbs. Check your salmon for any pin bones and remove as necessary with clean tweezers or needle nose pliers. If desired, gently marinate salmon, flesh side down, in some peaty Scotch (I recommend Caol Ila) for about half and hour. Pat dry. On a large piece of cling film, spread some of the salt and sugar mixture in an area slightly larger than the first fillet. Top mixture with first fillet. Sprinkle some freshly ground black pepper on top and cover with more salt/sugar. At this point, place the fresh dill on top. (Confession time: I didn't have fresh dill for this batch and will openly confess to using dried dill. The results will still be great. Used 3 - 4 tbsp dried dill if you must.) Repeat the process for the other fillet. and invert on top of the first fillet. Wrap tightly with cling film. Wrap with another layer of cling film to ensure nothing drips out of the parcel. Place in a dish with a high rim, like a pie plate. On top the whole parcel, place an inverted dinner plate. Add some weight on top the dinner plate. You can used can goods or anything else, just make sure the weight is distributed as evenly as possible. Place the entire set up in your refrigerator for 48 hours, turning the fish every 12 hours or so. When done, briefly rinse under running water to remove any excess salt. Dry thoroughly with paper towels and slice on the bias as thinly as possible. Use your sharpest knife and try to slice with one long stroke instead of sawing away. 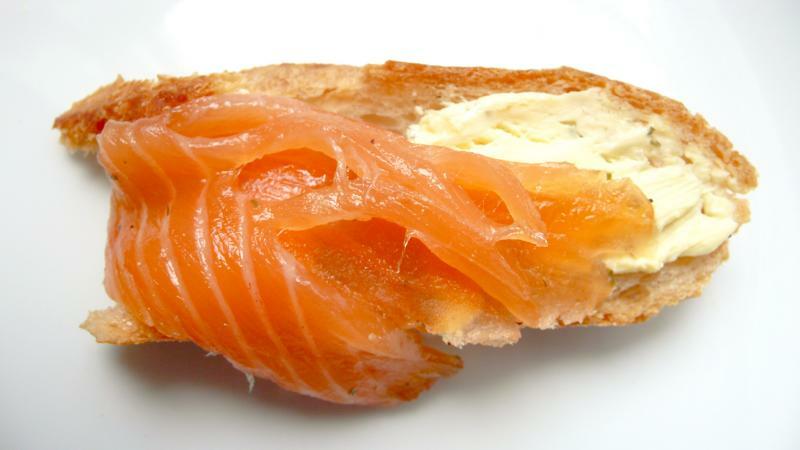 Great for breakfast with cream cheese on a bagel, or better still: some baguette. This weekend I celebrated our nation's independence by playing wiffle ball, eating all sorts of grilled food, waving sparklers through the evening air, and becoming famous. That's because I recently had the wonderful opportunity to be featured on The Wanderous. The Wanderous is a great blog devoted to all things awesome (ergo, my status as awesome has now been secured). When you are done reading this, head over to The Wanderous and learn about all sorts of really cool things you'll never knew you were able to live without. Compound butters are a great way to infuse more flavor into a meal. The basic principle is this: let butter soften and then add any ingredient (herbs, spices, etc.) that would help compliment what you are going to serve. Compound butters are not used for cooking. They are used more as a garnish, to be spread onto grilled vegetables, roasted meats, and other tasty items. Think of it as a ready made sauce just waiting to be used. You can freeze them, like you would any butter, and slice off a piece as needed. In a bowl, combine all ingredients. With your hands, mix thoroughly until well combined. 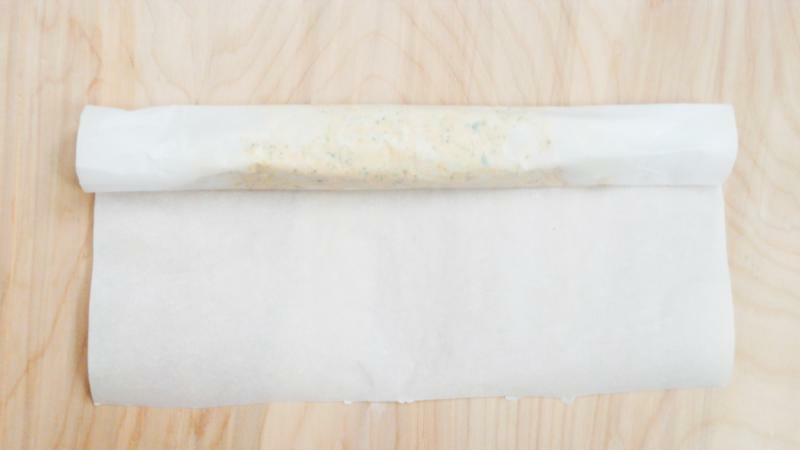 Take a sheet of parchment paper, and scoop out butter mixture close to one end. Try to form into a log shape. 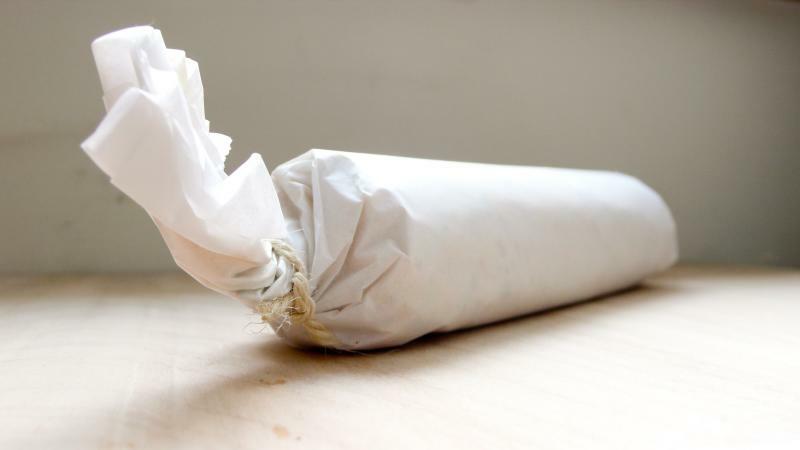 Gently roll the paper up, giving even pressure to compress butter into a tight log. Twist the ends of the parchment and tie with kitchen string. Place in fridge or freezer until cold enough to slice. 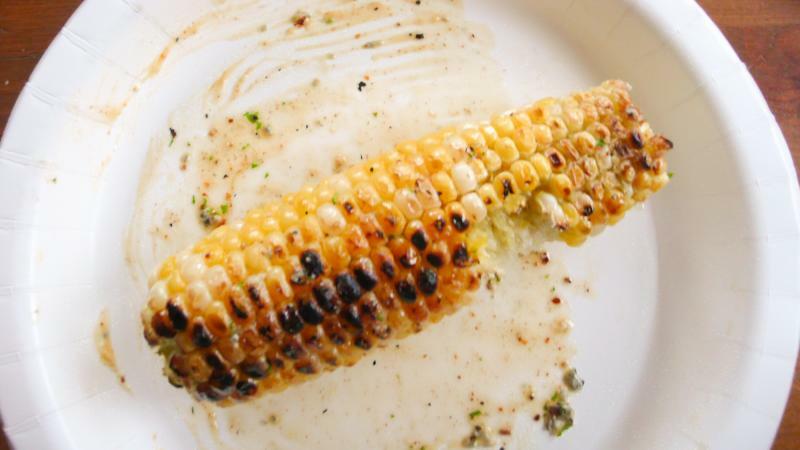 Try it spread over some freshly grilled corn on the cob! I've found myself rather busy lately and without much time to sit down and cook. When I can peer into the future and see myself heading in eight different directions at once, I like to cut myself off at the pass and prepare a large batch of food for times when cooking is not going to be an option. Usually, this happens in the winter and large quantities of minestrone soup fits the bill. But seeing as it is now officially summer (and hot, hot, hot! ), minestrone soup is sort of out of the question. Instead, I made this delicious little empanadas. Easy to make, and even easier to eat on the go, these little guys transport very well when you are no where near your dining room table. Several hours (or even the night before) you want to start cooking, grind up the allspice berries, cumin, and black pepper until they are every fine. Rub into the pork and let it sit (covered) in the fridge: at least 4 hours. Also, slice the cherry peppers thinly and place into a clean glass jar with 1 cup orange juice, 1 cup apple cider vinegar, and 1/2 cup of cilantro. Screw on the jar and place in the fridge (for at least 4 hours). Preheat your oven to 325F. In a large dutch oven, heat 3 tbsp olive oil over medium heat. Add garlic and gently saute, but to not burn. At this point, also add the pork shoulder. Allow the shoulder to brown, turning it to get every side. When browned all over, add the remaining orange juice and the lime juice. Cover and place in the oven for 2.5 hours, or until fork tender. Let the pork rest for 30 minutes after braising. Then shred the pork. 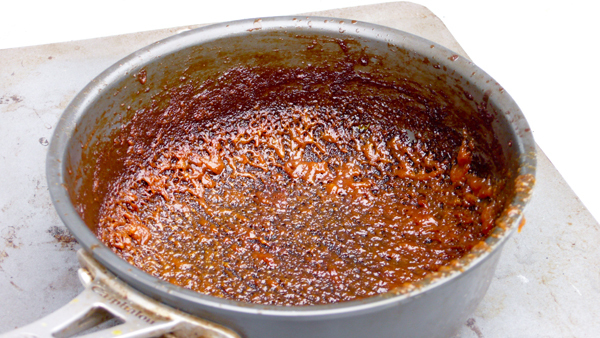 I like to take the braising liquid, which now has a TON of flavor, and reduce it on the stove until it is just under one cup of liquid. I then pour this over the shredded pork and add another 1/2 cup of chopped cilantro. It is only now that I would think about seasoning it with salt and pepper. Next, heat up grape seed oil in a skillet for frying. 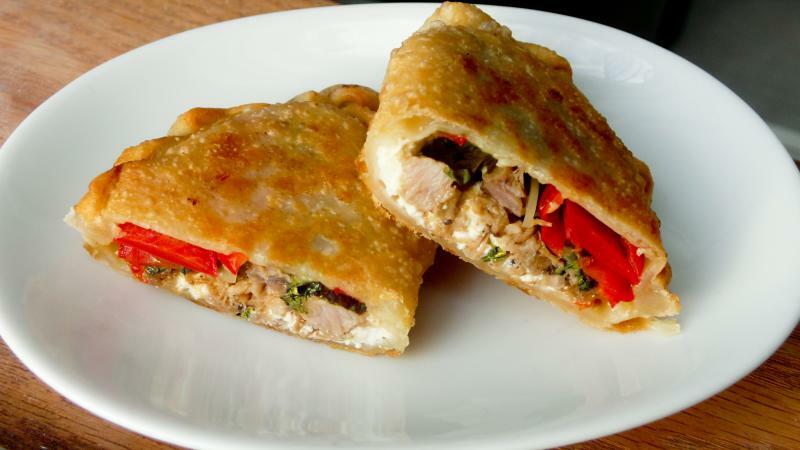 While the oil is heating up, spread 1 tsp farmers cheese onto an emapanada wrapper. 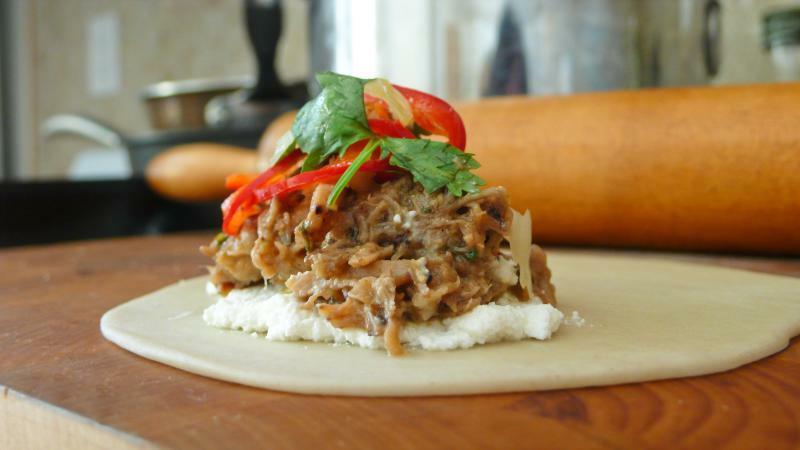 Top with a tbsp or so of the shredded pork, and a few slices of our pickled peppers. Make sure you are placing your filling off center. Fold over the empanada wrapper and crimp the edges together making a tight seal. Gently fry each empanada for a minute or two per side, until nice and golden brown. Let them cool for a few minutes before serving. Yesterday, I told you about a great asparagus, lemon, and egg soup and how it was made by three people for something great. Well, it was all a part of a test drive for Baltimore's latest 'diy restaurant'. Announcing: Sometimes. 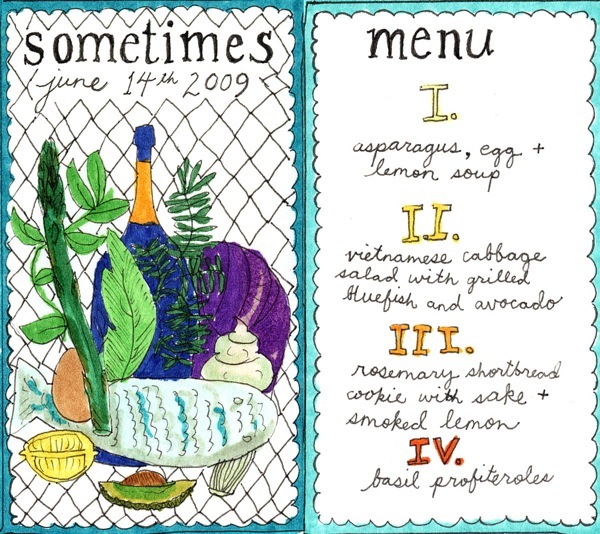 Sometimes is an alternative dining experience dedicated to serving great food for those who prefer something slightly different you cannot get at a regular restaurant. Sometimes has a small staff (three cooks, two servers) which allows for greater flexibility in how and when meals are offered. Like the name, sometimes the restaurant is open, and sometimes it is not. So how do you attend? Check out sometimes and find out. This soup is a subtle one. The asparagus and lemon flavor is there, even though you are staring at a relatively clear broth. But the real treat is the raw egg yolk. By pouring the soup over the yolk, you are not only slightly cooking it, but you are creating a culinary bomb. When you go to eat the soup, you pop the yolk. 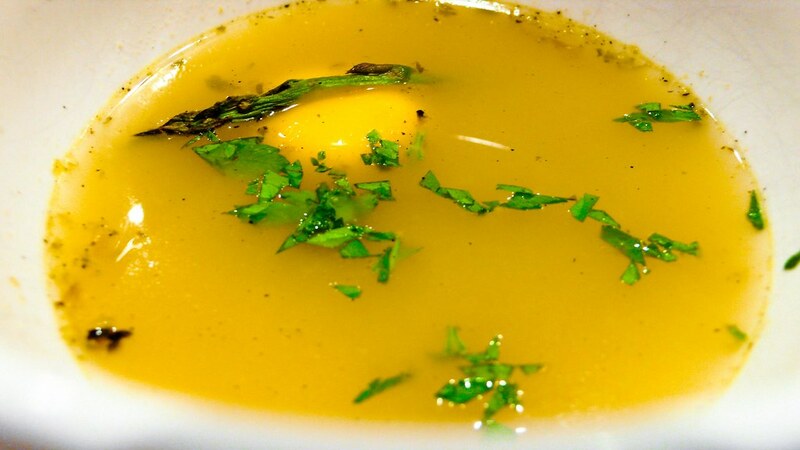 This releases the still runny yolk into the broth, changing the seemingly thin bodied liquid into a rich and lip-smacking soup. 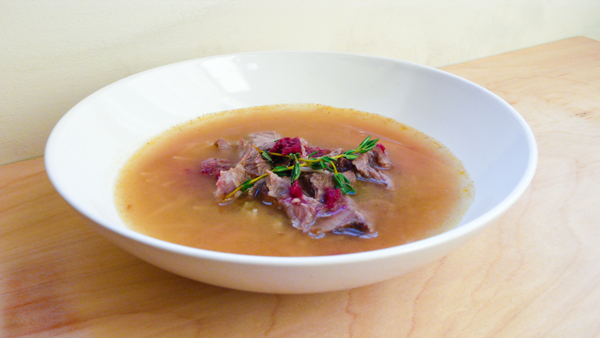 Bring stock to a boil in a large stock pot. While the liquid is warming up, grill asparagus until done and slightly charred. Remove hard part of the asparagus stem and place in a blender (reserve a few) with a ladleful of stock and some parsley. 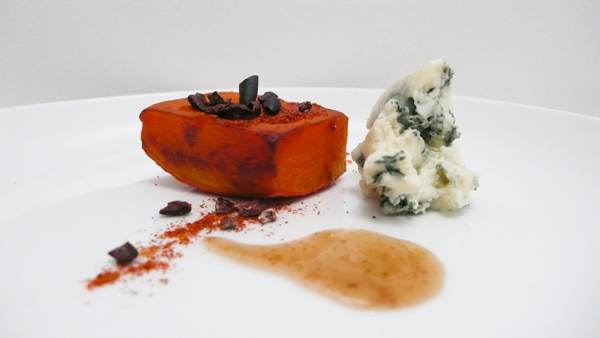 Puree until smooth. Add to stock and simmer for a few minutes. Zest and juice the two lemons. Add zest and juice to the stock. Stir well to mix thoroughly. Taste and season with salt and pepper. Lastly, add an egg yolk to each bowl. Gently ladle the soup (which is warm but not too hot: allow the soup to stand for a few minutes if too hot) over the egg yolk and garnish with some parsley and the tips of the reserved asparagus. Finally. Sorry for the delay with this. I have excuses, but I honestly don't even think they matter a whole lot. But, I finally got around to using my preserved blood oranges. As I mentioned before, I was interested in trying these out as a response to the lack of a thorough taste description of preserved lemons. Well, I still haven't had preserved lemons, but if they are anything like my little blood oranges here, you can just go ahead and sign me up as a preserved lemon lover as well. So what do preserved blood oranges taste like? 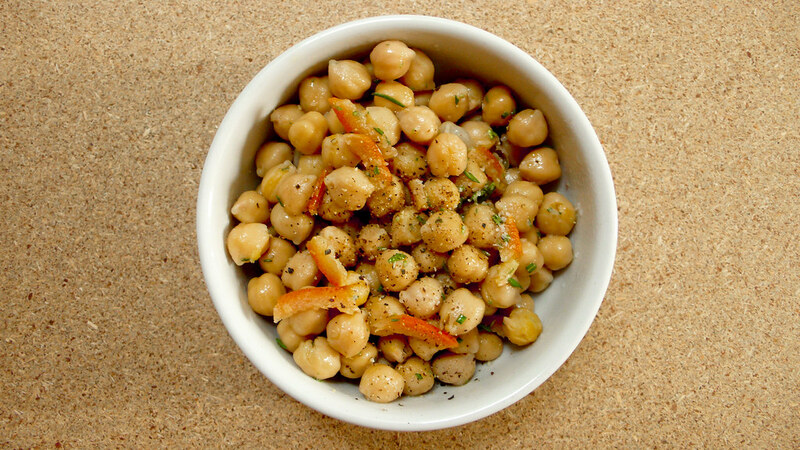 Well, to find out I simply cooked them with some chickpeas and rosemary. I didn't want anything too complex to cover up the flavor of the oranges so this time I restricted myself to two ingredients (plus some olive oil, salt, and pepper). 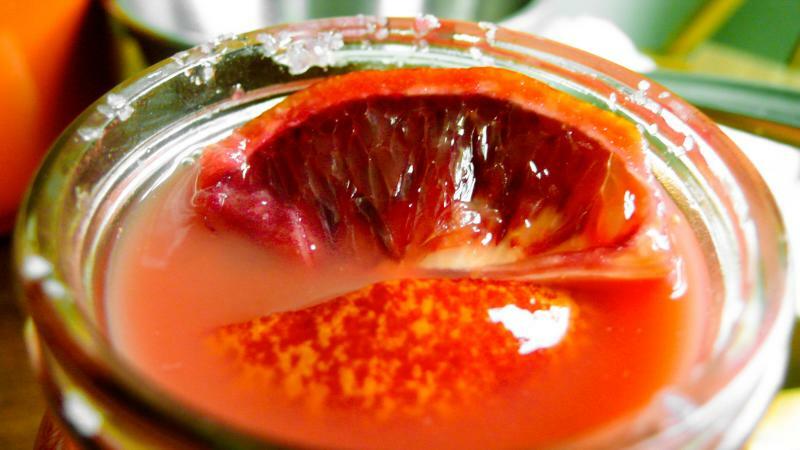 I used the rind of one quarter of a preserved blood orange. You don't eat the flesh, it is simply too salty. The rind has a slightly squishy texture and the pith is translucent, like it has been candied. The first thing you notice about them is they are very, very salty. But that saltiness is immediately followed by an intense citrus flavor. Definitely orangey, but I really can only describe it as uniquely citrus. And in combination with the rosemary, the preserved blood orange still shined through, although the 'piney-ness' of the rosemary supported it very well. This is definitely one to keep in the rotation. I'm sure you'll see more preserved blood orange on 6CD in the weeks and months to come. Until then, why not make your own? I know that I promised you last week that I would tell you more about my preserved blood oranges, but I just didn't get to them this week. You might recall that I am in the process of moving, so cooking has not really been on my radar this week. In fact, all of my pots and pans are already packed up. So, hopefully I will get to the blood oranges next week. (But don't hold me to it). I did, however, throw this little dish together for some friends the other day. It is very simple to make and doesn't require a lot of prep work. Plus, it tastes really good too. What were the odds? Preheat oven to 375F. Chop apples into bit sized pieces and radishes into quarters. In an ovenproof pan, heat olive oil over medium heat. Add apples and radishes and toss to coat with the olive oil. Cook for a few minutes before moving the pan into the oven. 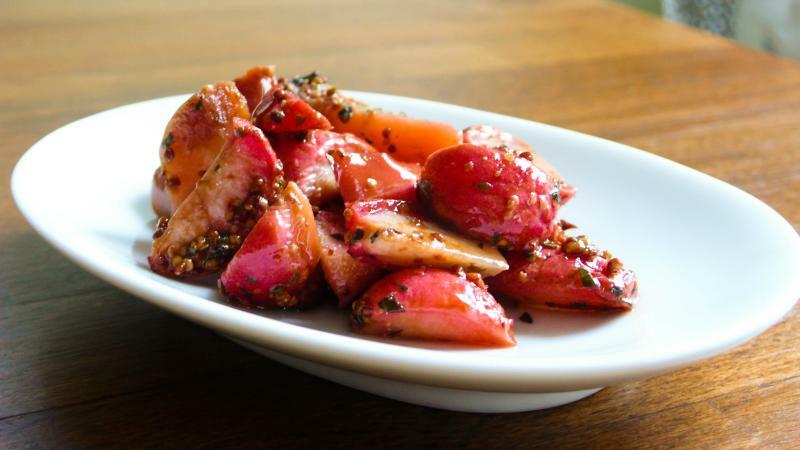 Roast the apples and radishes for 25-30 minutes or until very tender. Remove from oven and stir in mustard, mint, and balsamic vinegar. Season with salt and pepper and serve. 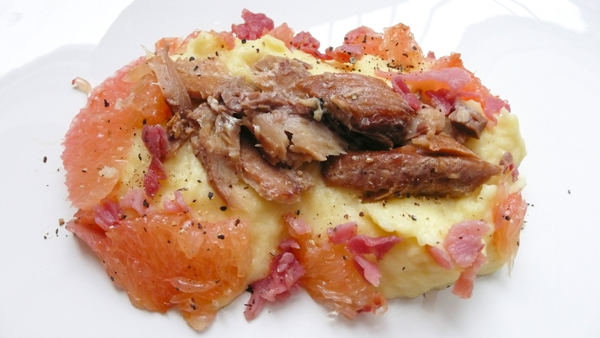 Remember my duck with blood orange mayonnaise post a while back? Go ahead and refesh your memory. I'll wait. Got it? Good. Well, I ended up not using all of my blood oranges and was about to just going to sit down and eat those radiant little fruits when a little inspiration showed up. I have heard about preserved lemons (the act of packing sliced up lemons in lemon juice and salt and allowing the 'citrus cure' to preserve the fruit) before but had never tried them. And in doing a little research, it became clear to me that it is very hard to get a good description of what they taste like. So, I thought I'd give it a go, but this time I would use my blood oranges. I started them shortly after my blood orange mayonnaise post and they have been waiting for me ever since. Basically, you scrub the orange well and slice it into sections, leaving them barely intact on one end. Then you rub plenty of kosher salt into the flesh and rind. Place them in a very clean jar, and pour even more kosher salt in. (If my memory serves me right, I feel like I used just under a cup of salt total.) Then you simply cover the salted fruit with blood orange juice. Screw the very clean lid on and let it rest in a cool, dark place for a few weeks. 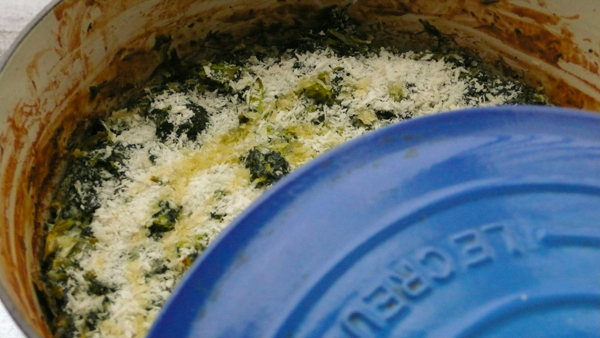 Every couple of days, give it a little shake to redistribute any undissolved salt. So, back to the big question. What do preserved blood oranges taste like? I'm not telling. At least, not yet. But soon. This is mostly because Six Course Dinner is in the process of moving. Not web pages or anything, but physically moving. As soon as the dust settles, I'll fill you in on all the 'juicy' blood orange details. So stay tuned. So I'm biking home from work the other day and I run into my friend Rachel who tells me how she and another friend Angie cooked something from my blog. This is news that I always like to hear. She begins telling me that they made my Camembert, Radish, and Sweet Corn Cakes but didn't have any panko. Well, ingenuity took over and Rachel sent her husband out to the nearest convenience store to find a suitable substitute. What did he find? Ritz crackers. The reports are in and the crackers got two thumbs up from my friends. And to top it off, it sounds like they are planning more 'bastardizations' of my recipes. I say bring it on! Of course, I am the first to admit that I do a fair amount of running around to find the right ingredients for the recipes on this blog. I am very willing to bike 5 or 6 miles just to buy the perfect kind of cheese. 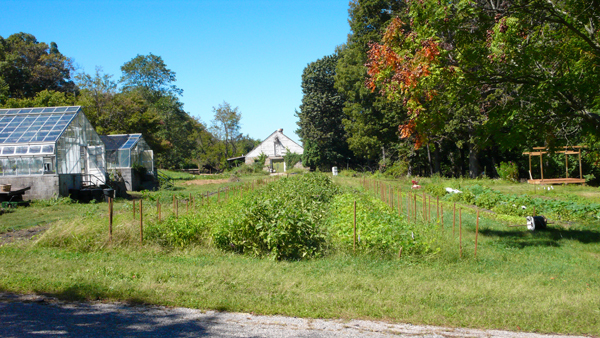 I will visit two separate farmers markets just to make sure I have all of my vegetables. I realize this may be a little nuts and most people probably are not going to be as willing to visit 3 to 4 food stores. Making multiple trips doesn't work for everybody. It was kind of fun to plan out something to cook while perusing the aisles stocked with everything from beef jerky to cultured yogurt drinks to AA batteries. After a few minutes, I figured out what I would make. Taking advantage of the Middle Eastern ownership, I found some bulgur wheat that I thought would be perfect. Everything else just fell into place. Remember, this all came from a convenience store. In a saucepan, heat condensed milk and water to a boil. When boiling, add bulgur. Stir briefly and turn off the burner. Cover and let sit for 30 minutes. Meanwhile, melt down the chocolate bars in a double boiler. Pour onto a sheet pan lined with parchment paper, spreading it out evenly and about 1/8th to 1/4 in. thick and stick in the freezer. Take the Fig Newtons and remove the cookie part, leaving only the fig paste center. 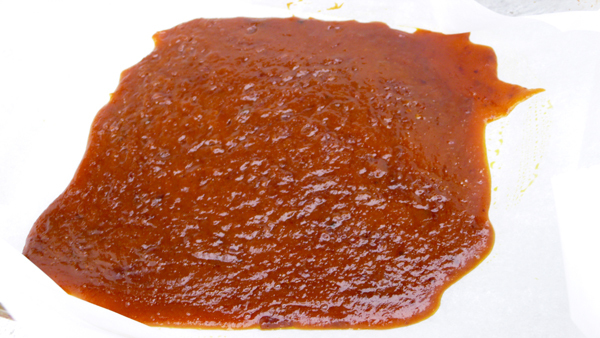 Reserve fig paste. When bulgur has cooled, spread onto frozen chocolate in an even 1/4 in. layer. Top with fig paste and crushed almond. Return to freezer for 20 minutes to set up, but don't let it freeze. 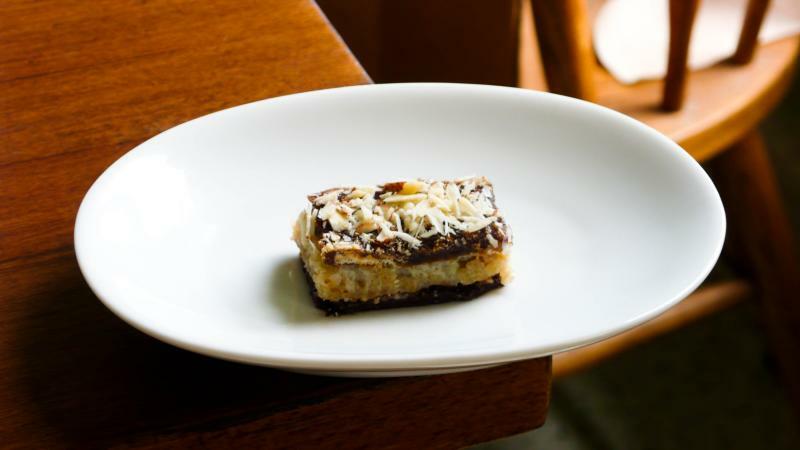 Remove from freezer and cut into rectangles the same size as the fig paste. Serve.